A Thinking in the Rain Adventure Story! Please meet Anastasia Pickering. She is a six-year-old philosopher who uses her out-of-the-mouth-of babes wisdom to influence the characters in her life. Her innocent process always concludes with a cleansing, colorful rain that leaves hearts mended and emotions soothed. Today is a very special day, for it is Anastasia’s sixth birthday and the day she gets her very first dog! A trip to the local animal shelter provides the perfect pet, but as the family leaves the shelter, their new dog, Rufus, seems frightened. 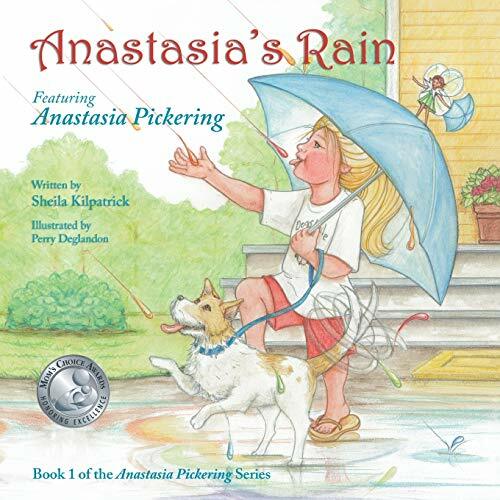 Rain starts to fall as Anastasia ponders what will help her new dog feel better. Through the guidance of Patience, a ponytail-riding, blueberry-snitching fairy, Anastasia patiently gives her new doggie time to adapt. Practicing patience turns the raindrops into twinkling colors that magically help Rufus trust his new best friend. As the family drives home, a double-tiered rainbow blankets the sky. . .is that a pot of gold at the end of the rainbow?